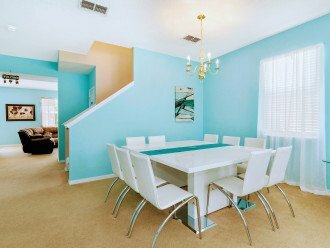 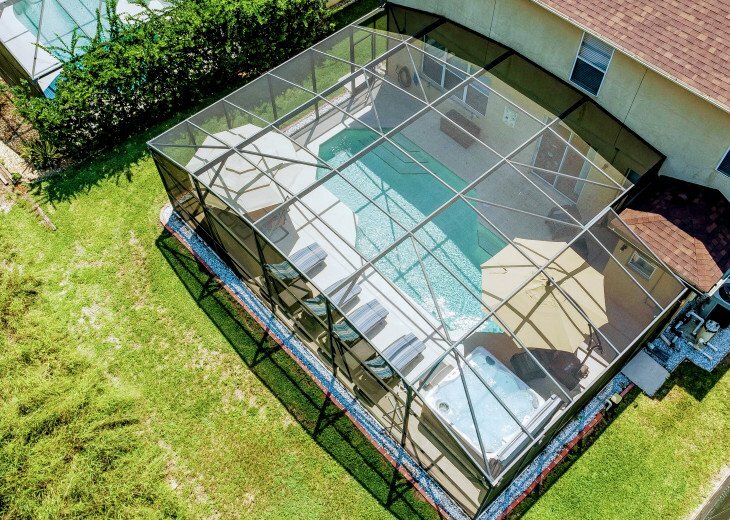 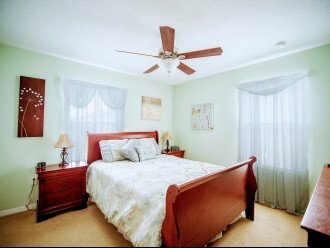 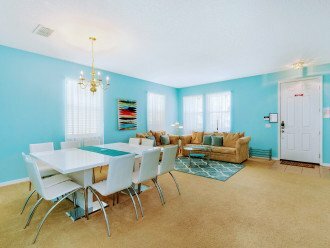 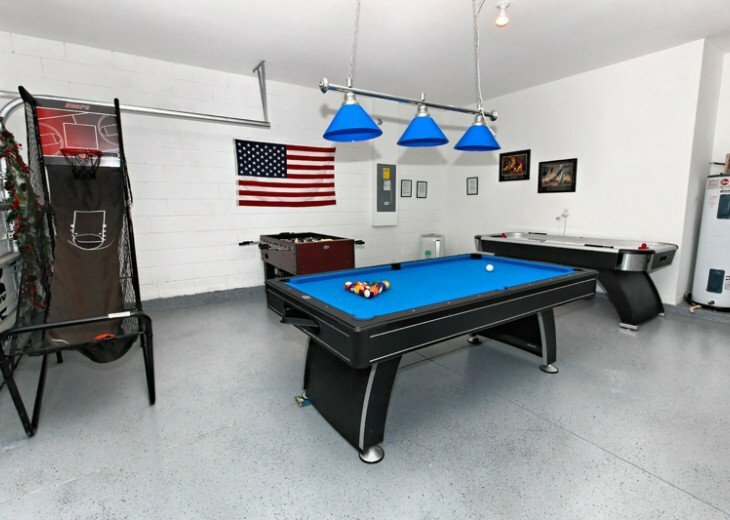 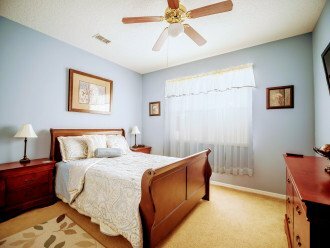 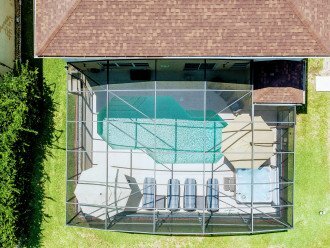 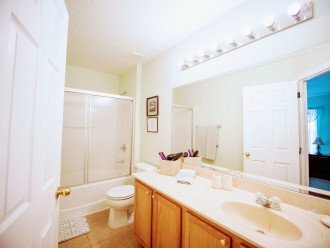 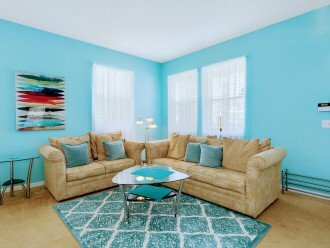 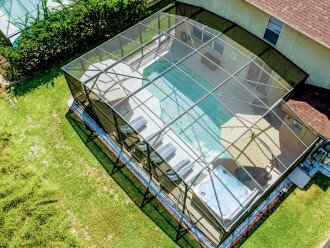 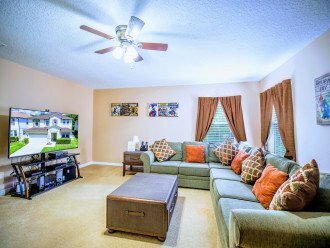 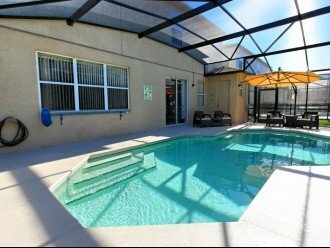 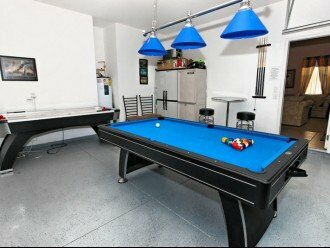 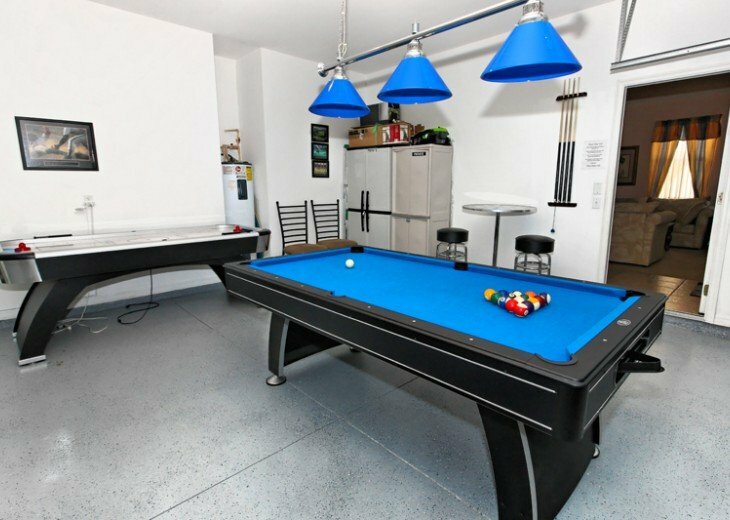 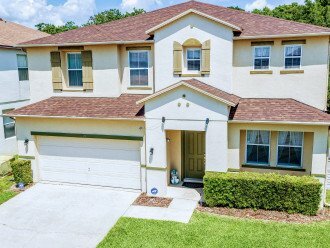 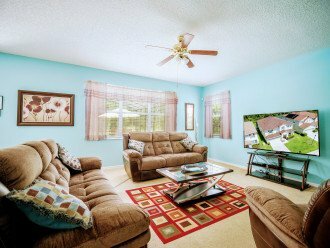 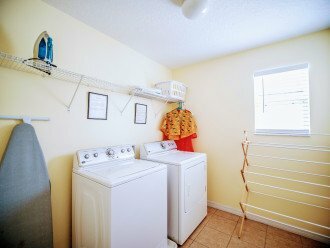 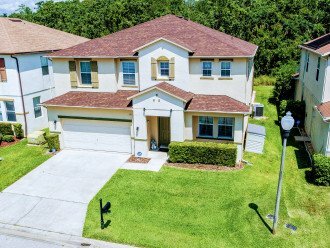 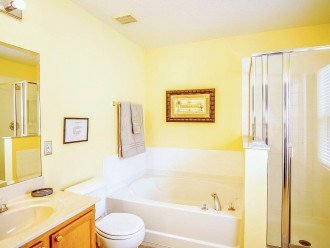 The home is located in Windwood Bay which is centrally located within Florida providing easy access to all the major attractions. 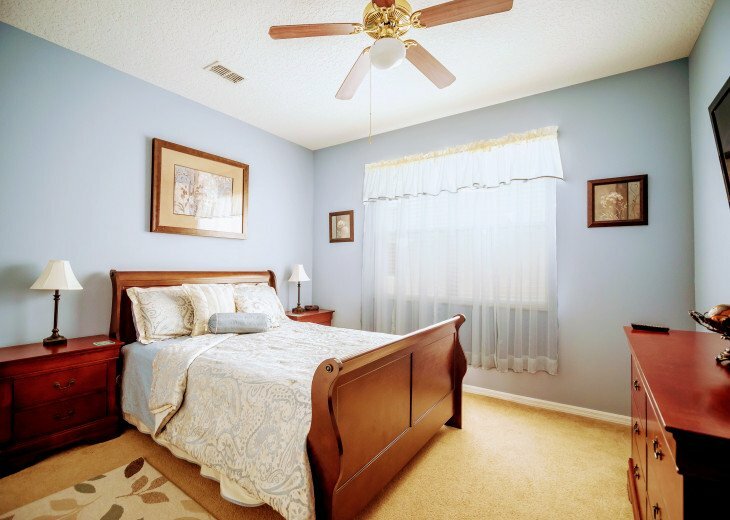 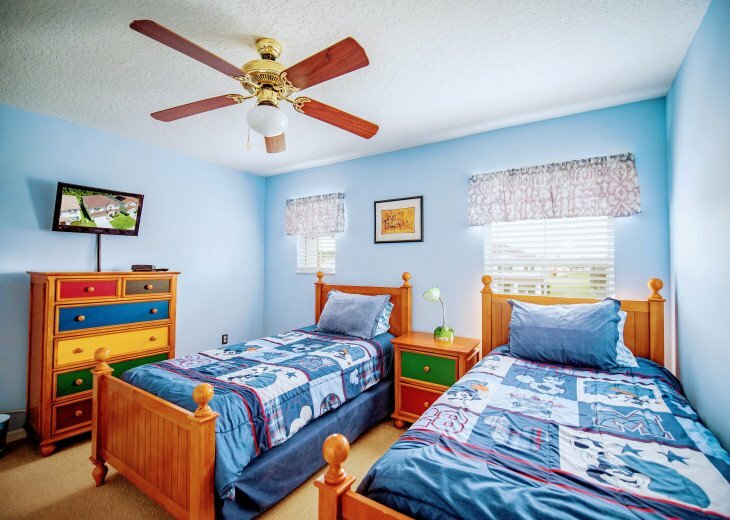 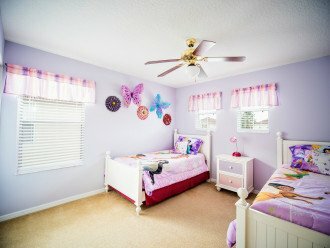 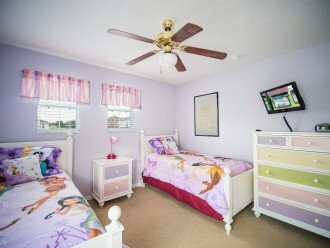 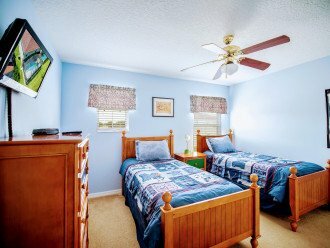 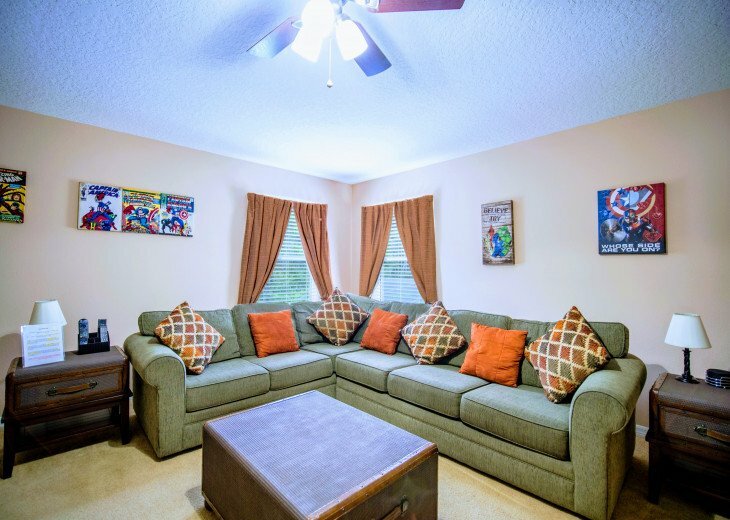 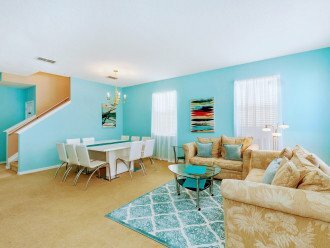 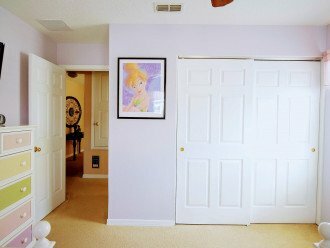 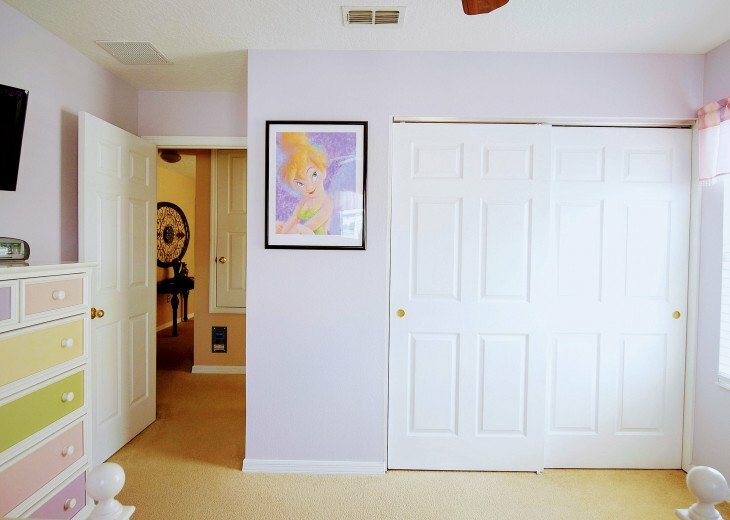 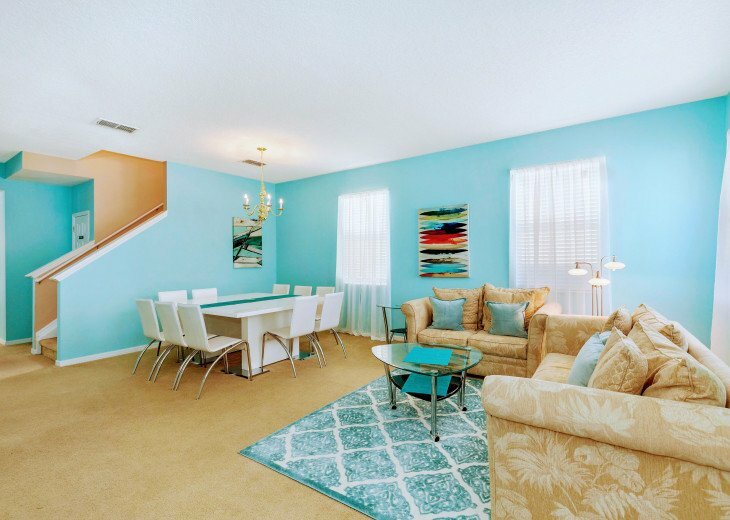 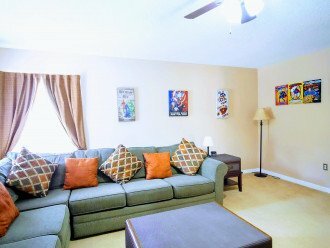 The villa is within a 15 minute drive to Disney, Sea World in 20 minutes and 30 minutes to Universal and Legoland. 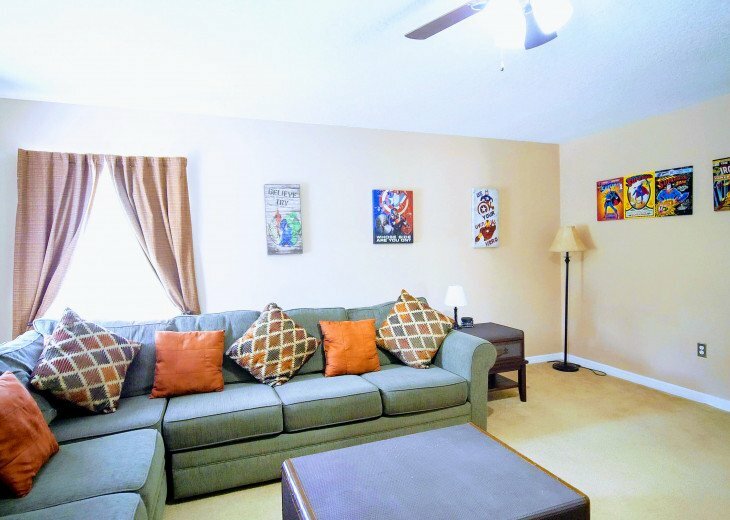 The easy access to the I4, US27 and US192 means that you are within easy reach of Kennedy Space Centre, Busch Gardens and beaches on both the Gulf Coast and East Coast. 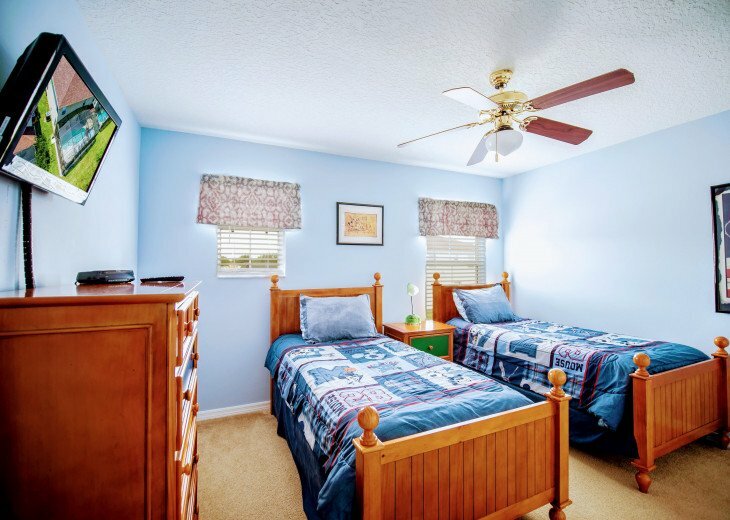 For the golf enthusiasts the villa is only a 2 minute drive to Champions Gate or Reunion Golf courses and within a 10 minute drive of many others. 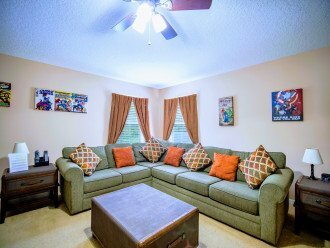 The family room is large and comfortable with a reclining sectional sofa and rocking/reclining armchair. 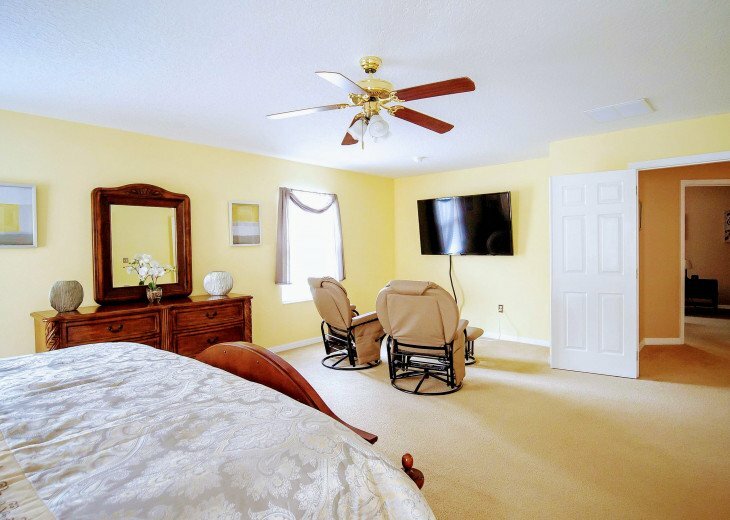 This provides comfortable seating to view the 65 inch HD TV with full HD package and DVD player. 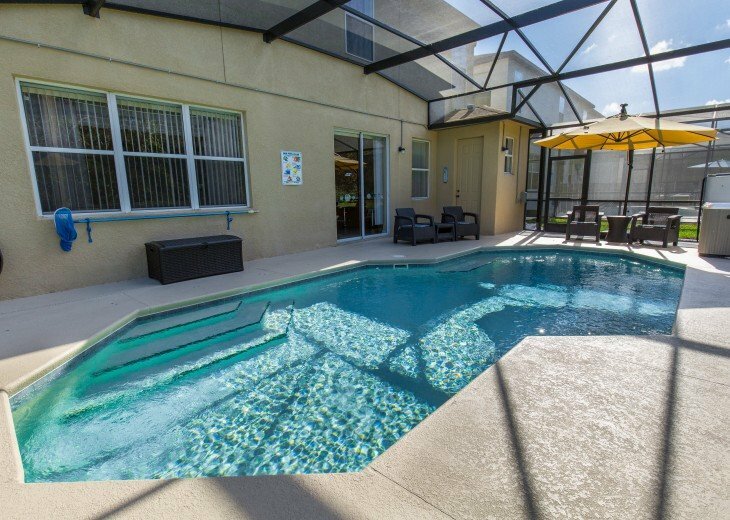 The family room overlooks the pool and conservation area. 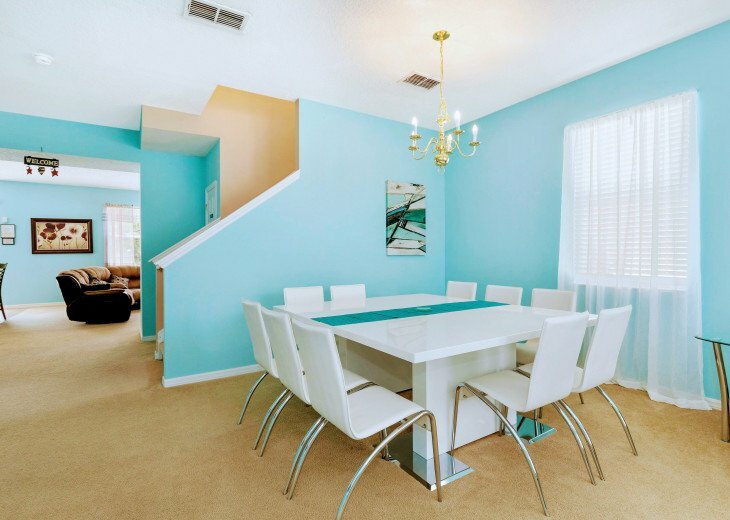 Adjacent to the sitting room is the formal dining area with an extending dining table to seat up to 10 people. 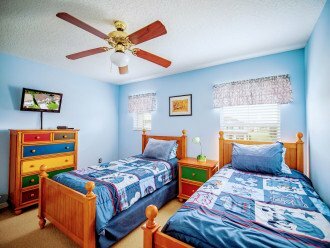 The 5 bedrooms consists of a Master King and two Queen suites all of which have en suite bathrooms, the further two twin bedrooms have access to the family bathroom. 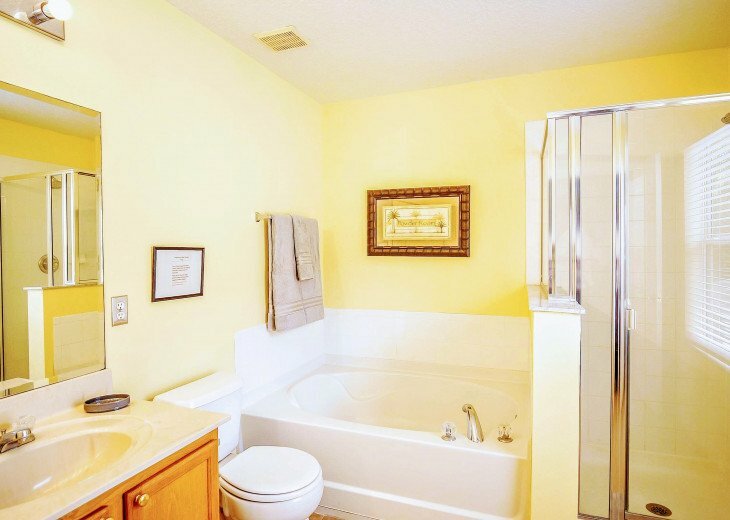 The master en suite contains his and hers sinks, walk in shower and a large bathtub. There is also a hairdryer for your convenience. 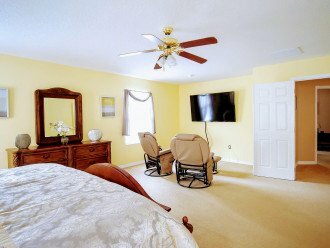 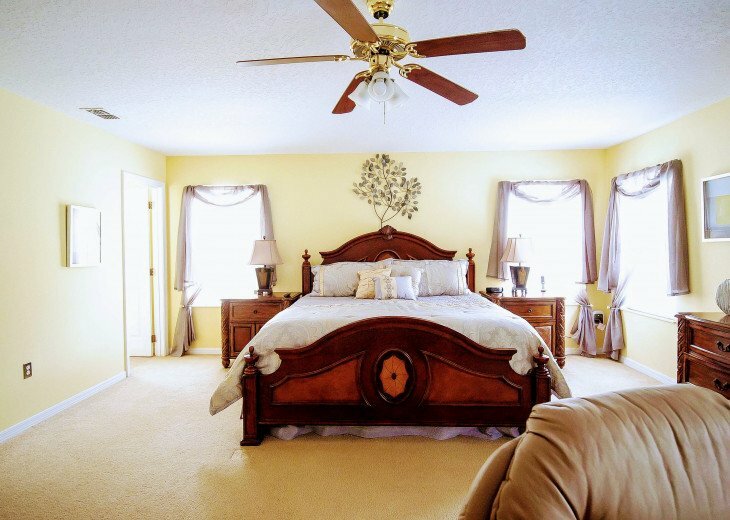 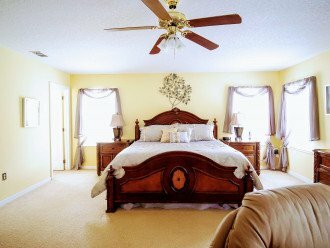 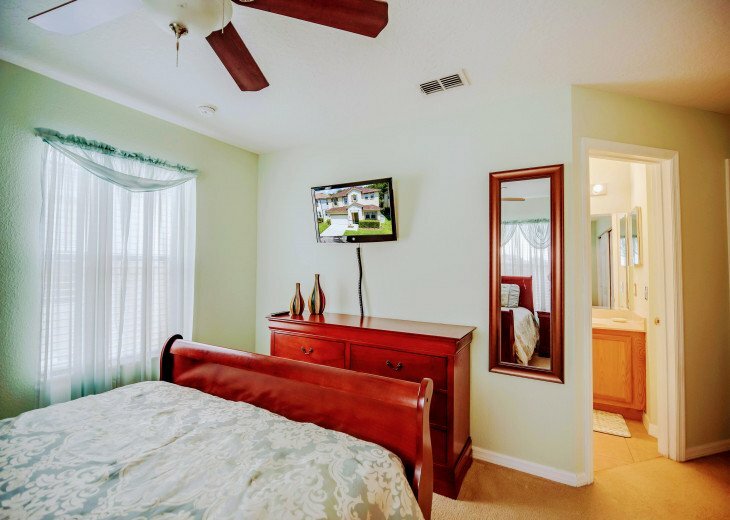 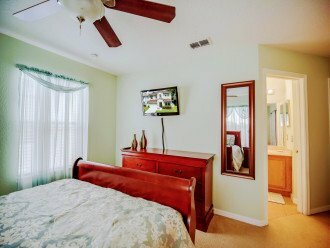 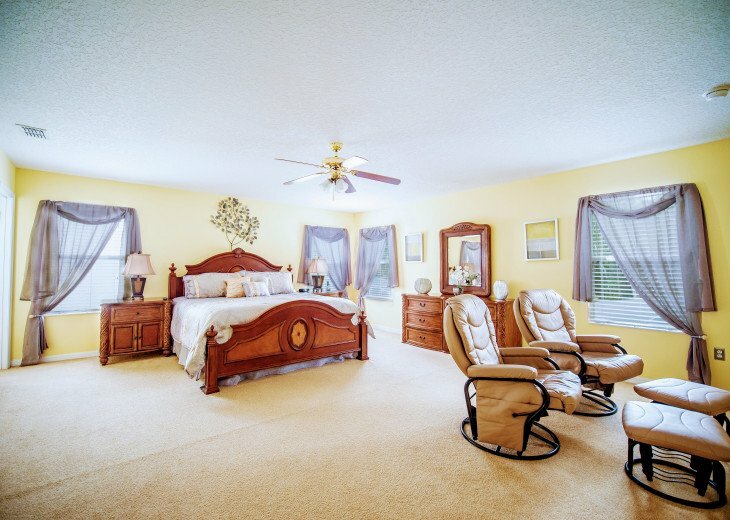 The two queen master suites, one located on the ground floor and one located on the first floor, are furnished to a very high standard both have 36 inch flat panel TVs. 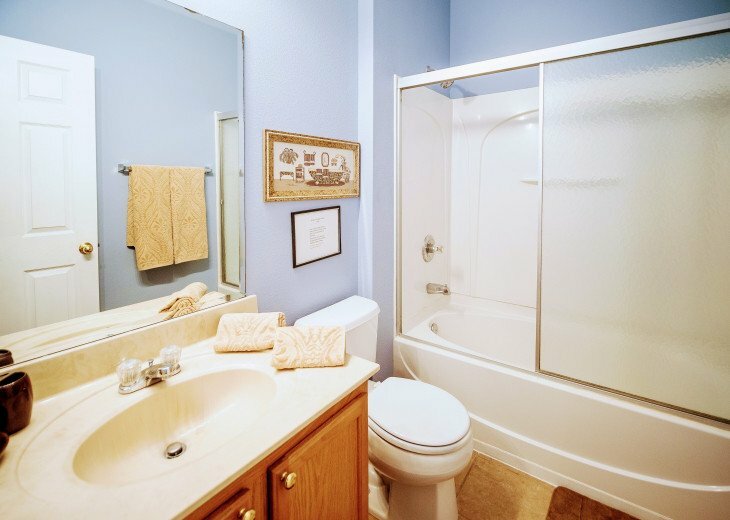 Both have en suite bathrooms with bathtubs with over bath showers. 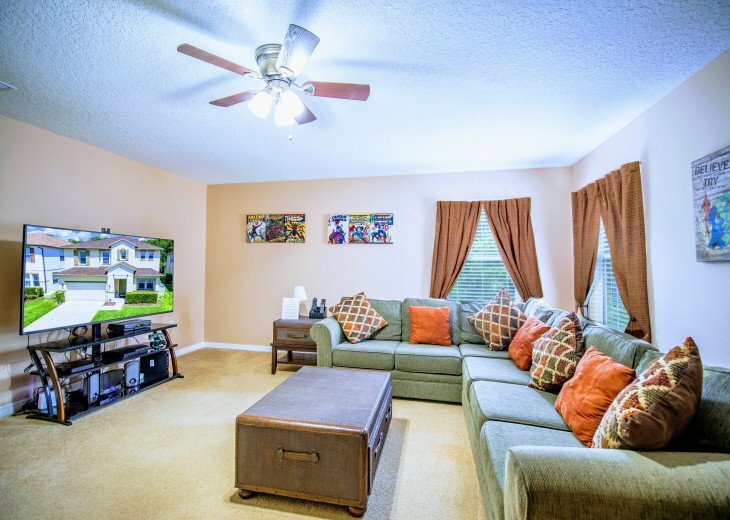 In addition to the 5 bedrooms, the upstairs living room has a 55 inch HD TV connected to it's own cable TV box allowing full HD experience with full HD package including UK Premier League football. 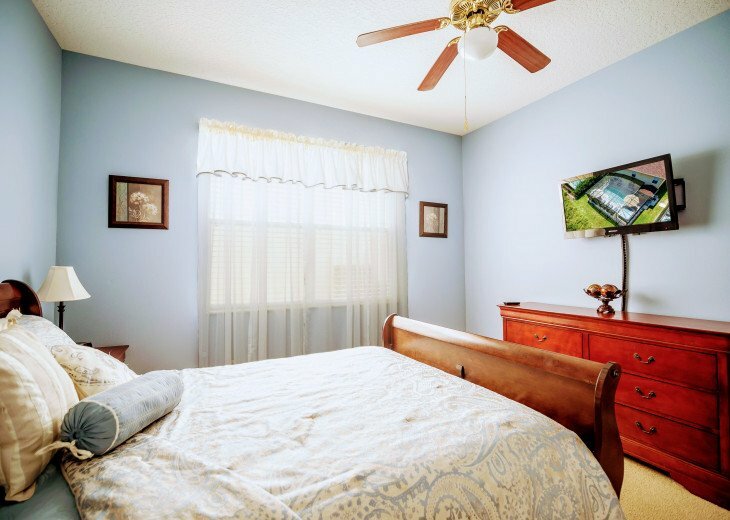 There is also a Playstation 3 with games and a DVD player and a stereo system to enhance your entertainment. 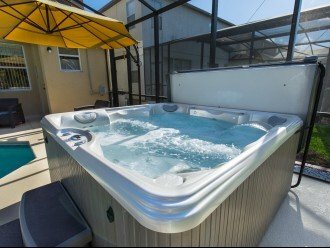 We also provide 2 travel cots, 2 highchairs, 2 stair gates and 2 strollers for your use at no additional cost as well as free use of our 2 TomTom sat nav's and our indoor / outdoor electric grill. There is also a large safe so you can secure your valubles while you are out at the parks. 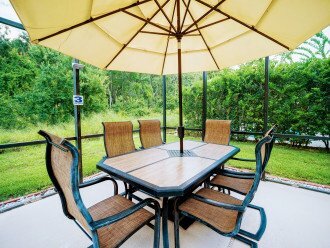 Our outside pool and patio area is equipped with a dining table and chairs so you can enjoy al fresco dining in the tropical climate. 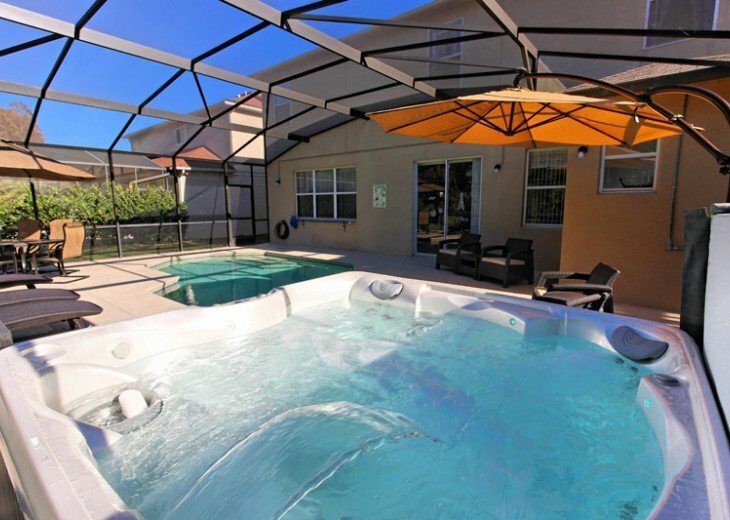 There are also sun loungers and chairs to allow you to relax in the Florida sunshine. 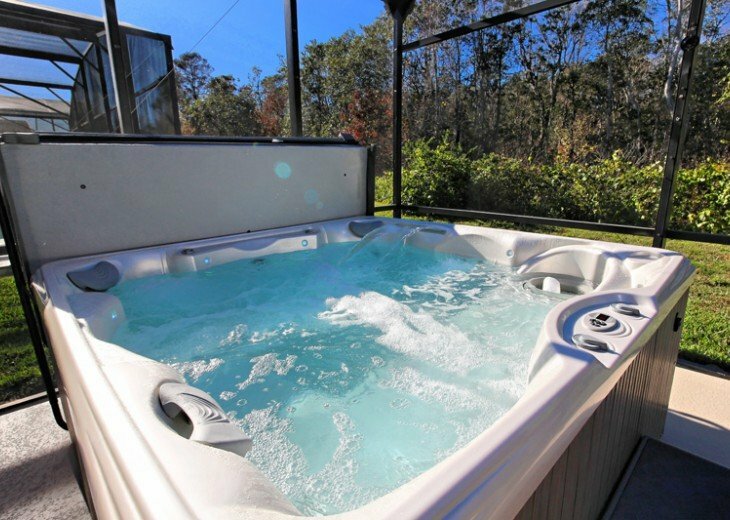 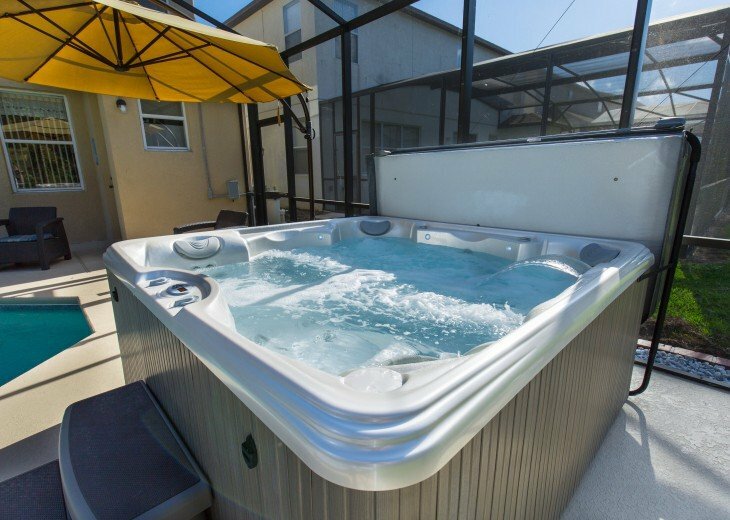 After a long day in the parks you can soak away the aches and pains in the 6 seater hot tub. 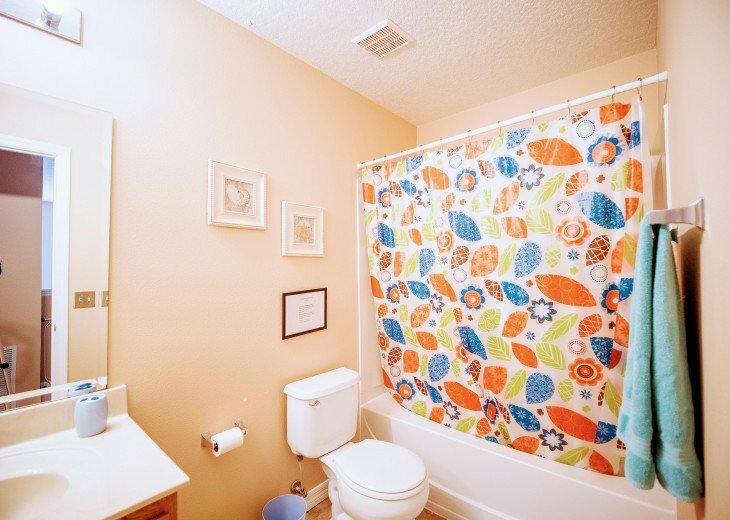 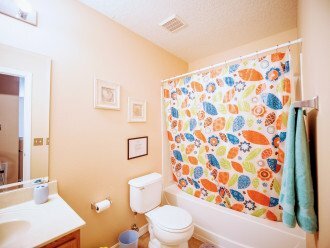 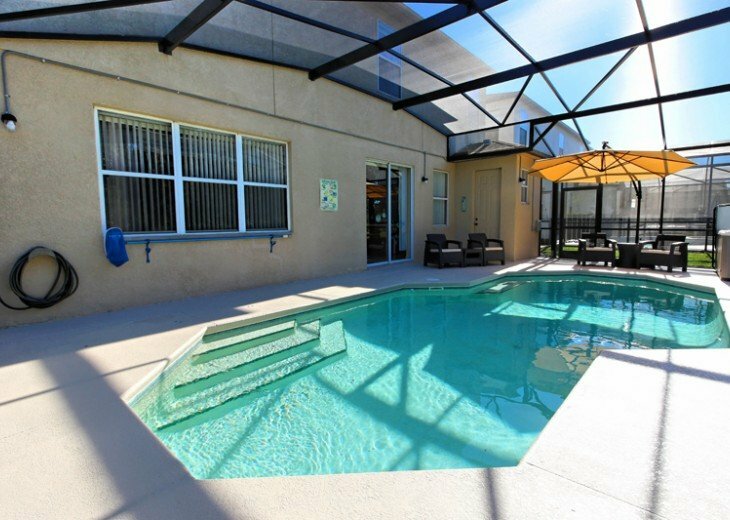 There is also a pool bathroom for your convenience so you do not need to leave the pool area when you have to go. 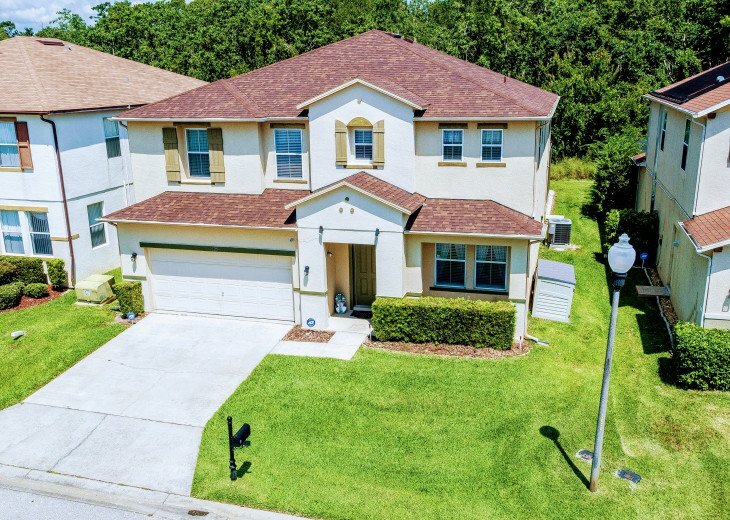 Windwood Bay, Davenport, Florida is a small, quiet location made up of similar up-market, luxurious homes. 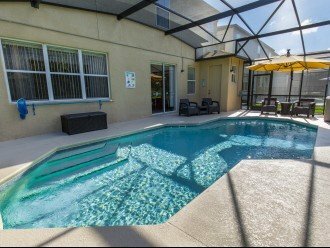 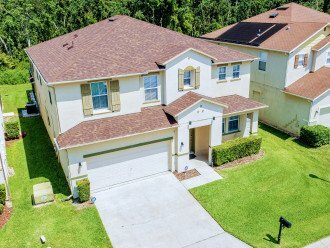 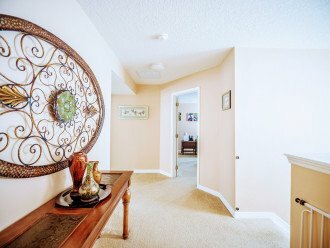 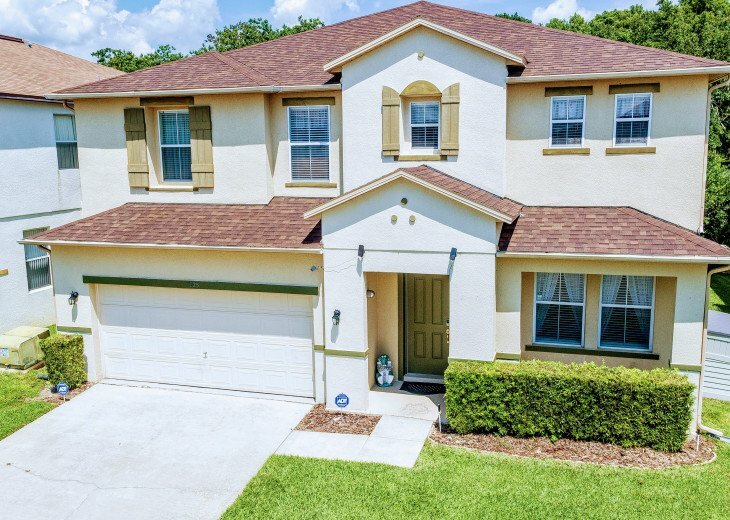 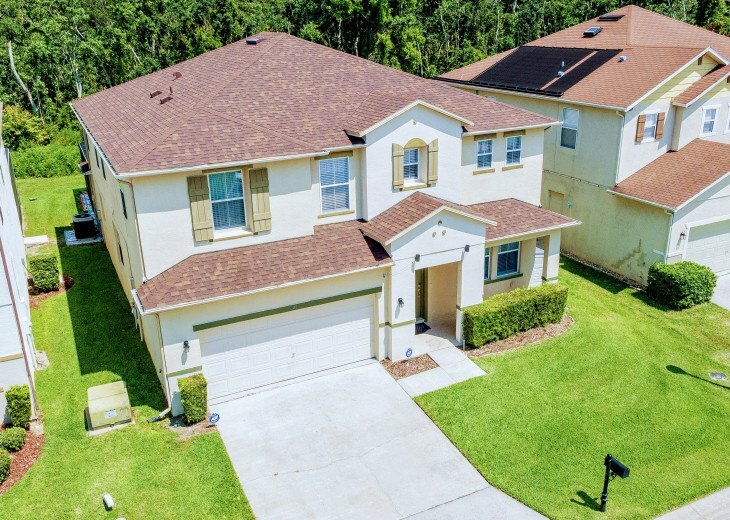 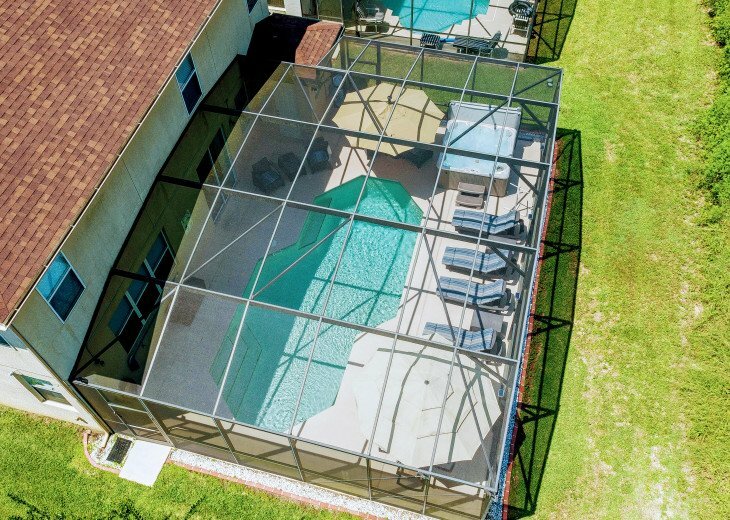 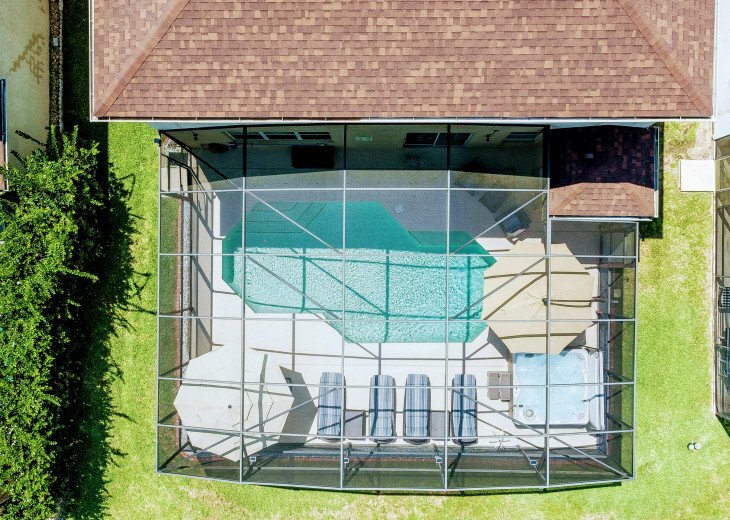 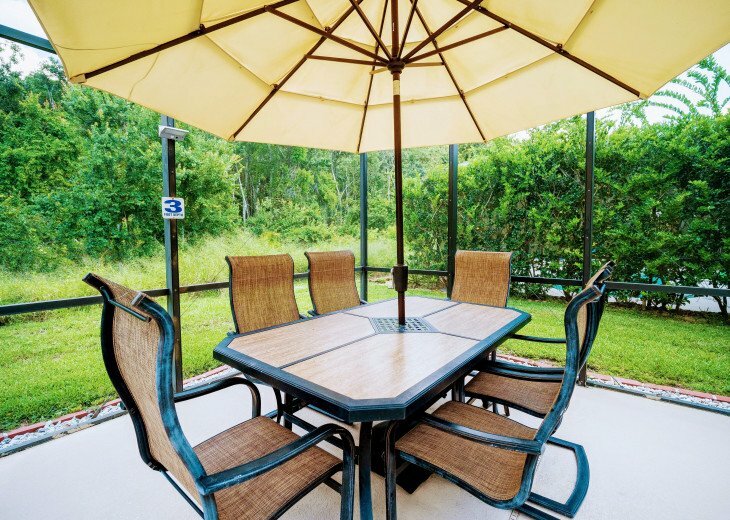 The community is an ideal location for holiday-makers to make their base whilst planning those great days out at Florida's popular theme parks, attractions, beaches, shopping malls, and everything that Central Florida has to offer. 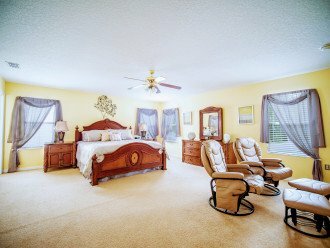 Thank you Brenda so glad you enjoyed your stay at the home.